False memory research has developed in response to a plethora of lawsuits and publicity about the prevalence of repressed memories of childhood sexual or satanic ritual abuse among patients undergoing therapy in the 1990s. 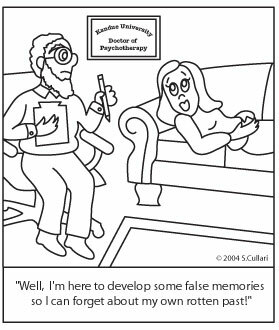 Research papers should show that misguided or deliberately irresponsible therapists used techniques to recover "repressed" memories that were the same ones that research demonstrated could be used to instill false memories, manipulate memory, or influence subjective evaluations of the correctness of memories. A research paper reviews some false memory literature and the history of what has been called a witch hunt for abusers. Since the 1990s an unprecedented number of adults claiming memories of childhood sexual abuse have sought remedies in court. Many of the adult cases were based on claims that repressed memories of child abuse were made available to them through therapy, enabling them to not only confront their accusers, but to send them to prison in some cases and receive multi-million dollar awards in others..
As the number of molestation claims based on recovered memories increased, some memory researchers began to question the wisdom of uncritically accepting claims of recovered memory as true, and to wonder what was going on in therapy to produce so many similar claims. Efforts to stem what grew to resemble a "witch hunt" for abusers, produced research showing that false memories can be implanted, that memory can be manipulated, that it is malleable, plastic and unreliable, despite subjective convictions that memories are correct. Other results showed that eyewitnesses could be manipulated or deceived, that children and adults in studies accepted suggested false memories as their own, and that memories that were false could scarcely be distinguished from those that were genuine. Controversy over the use of such memory research to discredit victimization claims has entered a more public forum than is usual for academia. The scientific literature on false memory now comprises thousands of papers, and the popular literature is equally fullsome. This paper will touch on a scant number of published works that have been used to substantiate a need to prevent police, clinicians, and others in influential positions from utilizing techniques and agendas that are demonstrably capable of instilling the conviction in others that false memories are genuine. Iconic Memory - Iconic memory is a type of visual sensory memory that is how the brain remembers images. Personal Unconscious Essays discuss Jung's theory of the creation of a suppressed memory region in the brain. Amnesia - In its simplest form, amnesia is understood to be a temporary or permanent impairment of some portion of the memory system. Dissociative Disorders - Dissociative Disorders research papers author the symptoms and signs of the psychological disorder that includes memory loss and identity change. Paper Masters writes custom research papers on False Memory Syndrome and delve into research on repressed memories of childhood abuse.